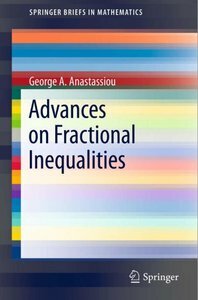 Advances on Fractional Inequalities use primarily the Caputo fractional derivative, as the most important in applications, and presents the first fractional differentiation inequalities of Opial type which involves the balanced fractional derivatives. The book continues with right and mixed fractional differentiation Ostrowski inequalities in the univariate and multivariate cases. Next the right and left, as well as mixed, Landau fractional differentiation inequalities in the univariate and multivariate cases are illustrated. Throughout the book many applications are given. Fractional differentiation inequalities are by themselves an important and great mathematical topic for research. Furthermore they have many applications, the most important ones are in establishing uniqueness of solution in fractional differential equations and systems and in fractional partial differential equations. Also they provide upper bounds to the solutions of the above equations. Fractional Calculus has emerged as very useful over the last forty years due to its many applications in almost all applied sciences. This is currently seen in applications in acoustic wave propagation in inhomogeneous porous material, diffusive transport, fluid flow, dynamical processes in self-similar structures, dynamics of earthquakes, optics, geology, viscoelastic materials, bio-sciences, bioengineering, medicine, economics, probability and statistics, astrophysics, chemical engineering, physics, splines, tomography, fluid mechanics, electromagnetic waves, nonlinear control, signal processing, control of power electronic, converters, chaotic dynamics, polymer science, proteins, polymer physics, electrochemistry, statistical physics, rheology, thermodynamics, neural networks, etc. Almost all fields of research in science and engineering use fractional calculus in order to describe results. This book is a part of Fractional Calculus, therefore it is useful for researchers and graduate students for research, seminars and advanced graduate courses, in pure and applied mathematics, engineering and all other applied sciences.